Sep 2015-March 2016- Visiting Scientist, Advanced Computing and Microelectronics Unit (ACMU), Indian Statistical Institute, Kolkata, India. 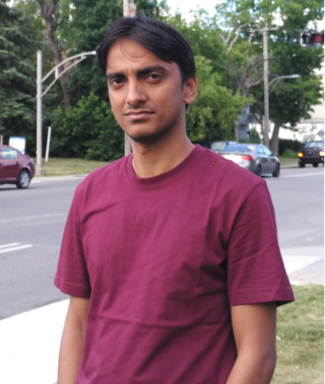 Barun Gorain and Partha Sarathi Mandal, “Solving Energy Issues for Sweep Coverage in Wireless Sensor Networks, Discrete Applied Mathematics", (Elsevier), Accepted for Publication. Barun Gorain, Partha Sarathi Mandal and Krishnendu Mukhopadhyaya, “Generalized Bounded Tree Cover of a Graph" Journal of Graph Algorithms and Applications, Vol. 21, no. 3, pp. 265-280, 2017. Barun Gorain and Partha Sarathi Mandal, “Approximation Algorithm for Sweep Coverage on Graph", Information Processing Letters (Elsevier), Vol. 115, Issue 9, pp. 712-718, 2015. Barun Gorain and Partha Sarathi Mandal, “Approximation Algorithms for Sweep Coverage in Wireless Sensor Networks", Journal of Parallel and Distributed Computing (Elsevier), Vol. 74, Issue 8, pp. 2699-2707, August 2014. Barun Gorain, Andrzej Pelc, Deterministic Graph Exploration with Advice, International Colloquium on Automata, Languages and Programming, (ICALP 2017), University of Warsaw. July 10–14, 2017, Accepted. Barun Gorain, Partha Sarathi Mandal and Krishnendu Mukhopadhyaya, Approximation Algorithms for Generalized Bounded Tree Cover in Proc. of 10th International Workshop on Algorithms and Computation (WALCOM 2016), Lecture Notes in Computer Science (LNCS-9627) (Springer-Verlag), Kathmandu, Nepal, March 29-31, 2016. Barun Gorain and Partha Sarathi Mandal, Energy Efficient Sweep Coverage with Mobile and Static Sensors, in the Proc. of International Conference on Algorithms and Discrete Applied Mathematics (CALDAM 2015), Lecture Notes in Computer Science (Springer-Verlag), IIT Kanpur, India, Feb 8-10, 2015. Barun Gorain and Partha Sarathi Mandal, Brief Announcement: Sweep Coverage with Mobile and Static Sensors, in the Proc. of 16th International Symposium on Stabilization, Safety, and Security of Distributed Systems (SSS 2014), Lecture Notes in Computer Science (LNCS-8756) (Springer-Verlag), Paderborn, Germany, pp. 346-348, Sep 28 - Oct 1, 2014. Barun Gorain and Partha Sarathi Mandal, Line Sweep Coverage in Wireless Sensor Networks, in Proc. 6th international conference on Communication System & Networks (COMSNET’14), (IEEE Xplore), Bangalore, India, January 7-10, 2014. Barun Gorain and Partha Sarathi Mandal, Point and Area Sweep Coverage in Wireless Sensor Networks in Proc. of 11th International Symposium on Modeling and Optimization in Mobile, Ad Hoc, and Wireless Networks (WiOpt’13), (IEEE Xplore), Tsukuba Science City, Japan, pp. 140-145, May 13-17, 2013. Barun Gorain, Partha Sarathi Mandal and Sandip Das, Poster Abstract: Approximation Algorithm for Minimizing the Size of a Coverage Hole in Wireless Sensor Networks, in Proc. of 14th International Conference on Distributed Computing and Networking (ICDCN’13), Lecture Notes in Computer Science (LNCS-7730), (Springer-Verlag), TIFR, Mumbai, India, pp. 463-464, Jan 3-6, 2013. Barun Gorain and Partha Sarathi Mandal, Optimal Covering with Mobile Sensors in an Unbounded Region, in Proc. of 8th International Conference on Wireless Communication and Sensor Networks (WCSN’12), Phitsanulok, Thailand, December 19- 23, 2012.